Do you know anyone who would love to create an extra $1,000 a month? If yes, share this opportunity with them. Successful living is not rocket science. You simply have to discipline yourself to do what must be done everyday. You must practice doing the right things and stop doing the wrong things. Everyone needs a place where they can begin looking towards the future and focusing on personal growth that helps them improve their financial lives. Lives are changed significantly when people make a clear and specific decision that they will not live a lifetime of struggle and poverty. Winners choose to grow and achieve the economic success they desire no matter what. Winners practice the laws and principles of personal and financial success to create the success they desire. Some make this decision at 15, and some at 50. Most people never make this life-changing decision. Joining a group of people who can help keep you accountable can make a world of difference. Its so easy to be detracted by stuff that only works to limit what we can do and achieve. Success requires passion and action that won't quit. What about you? What do you want your future to look like and why? Do you want the power to grow and prosper? Are you willing to start practicing the laws and principles of success that can empower your future and get you what you want? In 5 years, your life will be better, worse or about the same. What's your prediction and why? Would you say you're teachable? If yes, we'd like to help you get what you want. Listening to Touchstone Success Audios and connecting with like minded people can help make your life better. We're all capable of mastering a healthier mindset and attitude. Poor life performance can be improved with effective education and relevant training. Personal development is a universal doorway to empowered thinking. 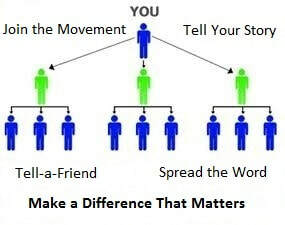 Referral marketing is a world-wide income system that can turn minimum wage earners into unlimited income earners. Over the past 5 years, has your life and financial health gotten better, worse or stayed about the same? Many feel that making ends meet is getting harder every year. 58 million people earn less than $15/hr. Are you one of them? What if everyone could start building a new source of growing residual income by listening to success audios and referring friends? Would you make time to learn how others are doing it? It's amazing what we could accomplish if everyone said, "Yes...Count Me In." Almost everyone I know needs growth and most of them do want more success in life. Our only product is success audios. The cost is $25 a month. We get paid for getting people enrolled. The income potential is unlimited. 78% live paycheck-to-paycheck; 40% can't come up with $400 in an emergency. Our jobs aren't paying enough. We need more useful information and a realistic income opportunity everyone can learn to do. Working together, we can overcome the limits of hourly wage jobs. Referral marketing is a solution hiding in plain sight. If I can do it, you can too. We're helping people make money by listening to success audios and referring friends to TSN. This is not rocket science. Everyone can afford $25 a month. ​Come Grow With Us... let's create the success we want. One of the greatest gifts we can give to others is our own continuous lifelong growth and personal development. Let us help you embrace a path to personal, spiritual and economic growth and freedom. ​Today, it can be more expensive to own a phone than own a part-time referral business. Personal growth is our only product. Truth sets people free to choose better ways of thinking and behaving. We cannot fully experience love, joy, peace, freedom nor abundance if truth has no impact on our state of mind. There's no lack of opportunity for teachable people. One of the greatest gifts we can give others is our own growth and personal development. There's no limit to what God can do for those transformed by truth. Truth can correct wrong habits of thinking and false beliefs. 1. Each of us enrolling 3 subscribers to our monthly audio CD messages could collectively produce a $1,000 monthly commission for you. 2. All enrolling 4 subscribers could produce a $4,000 monthly commission for you. 3. All enrolling 5 subscribers could produce a $10,000 monthly commission for you. Disclaimer: The projections above are to simply illustrate the mathematical possibilities of people eagerly choosing to enroll in our audio learning program. No income guarantee or promise intended. In fact, it's unethical to guarantee what anyone's actual income results may be in any referral based business. Actual commissions are based solely on audios purchased by subscribers. Earl Nightingale, the dean of audio learning said, "The human mind is like the soil of the earth, it doesn't care what we plant in it. The soil will grow poison ivy as easily as it'll grow corn. The soil doesn't care and neither does the mind." Let's not live a reckless thought life. Let's grow and prosper together. Working together, more ordinary people can get to a middle class life and income. is $25/mth paid by check, money order or credit card. ​We're helping people think better and bigger. Success and freedom demands that we keep digging. If not this...then what? A confused mind will do nothing. We must invest in preparing our minds for the future we want. Preparation time is never wasted time.​​​ Don't resell the lies you bought. Let's stop attacking and discriminating against ourselves with our own limiting beliefs and poor self-image. Unlearn your bad habits. Join us on our daily live conference calls. Learn how this amazing opportunity is building and empowering people. Just do it! Let's stop being today's economic slaves! Many will resist change until the pain of staying the same exceeds the pain of making a change. The working poor must be re-educated and led out of economic struggle much like Moses of the Bible led the Hebrews out of 400 years of slavery in Egypt. Our greatest economic limitation today is our own thinking, our conditioned mindset. We are not powerless to improve our thinking and economic condition. Today, we must all consider new and better ways of thinking and creating income. Success is not an entitlement. Success is a reward for putting forth your best effort and working toward your goals. If you don't have a plan to earn a middle class income, join in with others embracing our amazing personal development referral system. We can either continue struggling alone for our economic survival or we can wake up and realize we can achieve more working together. $25 a month is a small price to pay for a lifetime of personal and financial growth. Stop letting what's behind you, keep you behind. ​Economic success beyond the limits of our jobs is possible if we move forward, work together and keep going. ​If a $25 monthly investment in personal growth and getting others involved can set us free to prosper, what are we waiting for? Working together, we can all achieve more! for the call you want to listen to. Note: These calls are posted for one week and replaced with the next call recorded on that day. Touchstone Success helped me discover my calling and ministry. ​We're not just selling personal development audio CDs... we're sharing a relevant, sensible and practical solution to generational personal, spiritual and economic struggle. We're creating disciples and witnesses for mindset change from the bottom up. Listening to Touchstone Success Audios and daily telephone conference calls require no special skills...just a desire to learn, grow and do better. It's how we can equip ourselves with a healthier state of mind and a business opportunity everyone can do. Interested in learning more? If I sent you an audio CD, brochure, flyer and set you up with a temporary ID and personal website for 30 days, would you pay $10 to cover cost? "Things might start small, but the Lord is going to bless you with increase." ​"Things are now lining up for a breakthrough of what was previously closed." ​"Rise above the negative and stay focused on what God is revealing to you." Disclaimer: Any compensation illustration, visual aid, or verbal income example produced by Touchstone Success Network are only hypothetical examples. They are not intended to be representative of the income, if any, that you or any other Independent Representative can or will earn through participation in our marketing plan. The figures contained in any such testimonial, example or hypothetical should not be considered as guarantees or projections of your actual earnings or profits should you choose to participate as an Independent Representative. Any representation or guarantee of earnings, whether made by Touchstone Success Network or an Independent Representative, would be misleading. Success results only from successful sales efforts by you and your team, which require hard work, diligence, timing and leadership. Your success will depend upon how effectively you exercise these qualities, among others. Our Touchstone Success Referral Opportunity is promoting a personal development product at a fair marketing price that students of audio learning find compelling. Our intent is to help people experience the life-changing power of personal development by listening to our audio messages. We offer a 30 day money back guarantee if not satisfied with any audio message. We pay commissions only on audio CD sales. There is no direct correlation between number of members in your downline and monthly commissions paid. Commissions are only paid on CDs sold to genuine customers who value and purchase our monthly audio CDs to improve their mindset and skill sets necessary for success in both their personal and financial lives. Average monthly income of our distributors was less than $1,000 in 2017. TSN was founded in 2012.